Do you ever find yourself hearing or saying “This too shall pass” when everything feels so unbelievably hard or out of control? When the baby won’t sleep, the toddler is hurling food & cutlery across the room, the child is refusing to get ready for school and the partner is wondering why you’re stressed? But we don’t need to wait for things to pass. We don’t need to wish away our time with our kids, looking forward to when they are older and things won’t be so hard. We can enjoy what’s going on right now. Not in a trite “cherish every moment” kind of way. But in a confident way, armed with the knowledge & tools to help our kids stop being so annoying and for us to manage our own emotions & actions effectively. You can help your baby sleep better. You can respond lovingly when your toddler hurls everything across the room. You can use play when your child feels anxious or reluctant about going to school. And you can effectively offload your anger & frustration so that you don’t completely lose it at your partner. So if this sounds like what you need right now, be sure to sign up for my Special Consultation Package. & the FUN back into your family! Book my Special Consultation Package & SAVE $50! This is usually $200, but if you book before 12 March 2017, it’s just $150! Let’s chat, develop some strategies that are right for you, and let me support you in the day-to-day quagmire that can be parenting! My “baby” is nearing the last 6 months until he officially becomes a preschooler, and my 8 year old is becoming way more independent. So stop waiting for things to pass – it will fast enough. 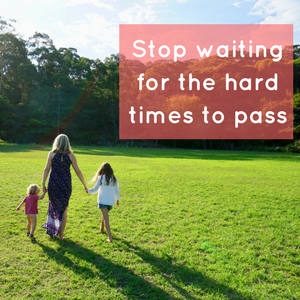 Make the most of now by arming yourself with these amazing strategies coupled with one-on-one support, to enjoy these full-on years as a parent.